Restaurants and retailers should not serve raw dough to customers or provide raw dough for children and other guests to play with. Anyone who becomes ill after handling or eating any of the products recalled in connection with this outbreak is urged to seek medical attention. They should tell their health care providers about their possible exposure to E. coli O121 and E. coli O26 to help ensure proper testing and treatment. Symptoms of infection usually begin between two and eight days after eating or drinking something contaminated with the bacteria. Most people develop diarrhea, which is often bloody, and abdominal cramps, recovering within a week. “Some illnesses last longer and can be more severe, resulting in a type of kidney failure called hemolytic uremic syndrome (HUS),” according to the FDA report posted Thursday. “HUS can occur in people of any age, but is most common in young children under 5 years, older adults, and people with weakened immune systems.” Anyone with symptoms including fever, abdominal pain, pale skin tone, fatigue and irritability, small and unexplained bruises, bleeding from the nose and mouth, or decreased urination is at risk of HUS and should seek emergency medical care. The recalls General Mills issued its first flour recall related to the outbreak on May 31. After tests showed the outbreak strain in bags of flour collected from outbreak victims’ homes in three states the company expanded the recall twice, eventually recalling 45 tons of flour. These are three of several varieties and brands of flour recalled by General Mills in relation to a multi-state outbreak of E. coli. Company officials have repeatedly said the 45 tons is a small fraction of their annual production, but have declined to provide specific numbers on volumes produces and sold. 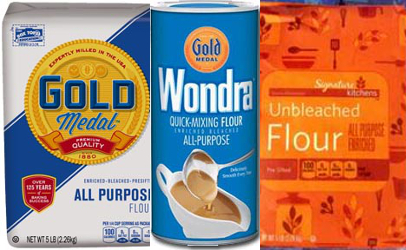 In addition to the recalled General Mills flour — Gold Medal, Signature Kitchens and Wondra brands — a variety of packaged and fresh foods were recalled because they were made with the implicated flour. They ranged from brownie mixes to meat and poultry products. A list of the recalled products is available on the CDC website. Although federal law currently in effect requires food companies to be able to trace their products to at least one entity before and one entity past them in the supply chain, neither General Mills nor federal officials have published that information. Clauses providing corporate secrets protection prohibits FDA from releasing the information, which companies and consumers could sometimes use to identify recalled food. “General Mills also sells bulk flour to customers who use it to make other products. General Mills has contacted these customers directly to inform them of the recall. FDA is working with General Mills to ensure that its customers have been notified, to evaluate the effectiveness of the recall and monitor the firm’s corrective actions,” according to the report posted Thursday by the FDA. “In general, supplier-customer relationships are confidential and, because of legal restrictions on disclosure of commercial confidential information, FDA is generally not authorized to release the names of these customers or the products they make with the flour.” The investigation Relatively new laboratory techniques such as whole genome sequencing (WGS) proved to be key in the detection of the E. coli outbreak. The technology also provided a trail of genetic breadcrumbs for investigators. Victim interviews gave the CDC and state epidemiologists even more evidence connecting the flour to sick people.